The 4th Industrial Revolution is here – are you ready? 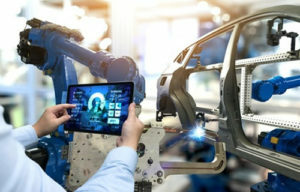 With 400 000 manufacturing jobs lost since 2008, elevated labour costs and a 3% drop from 15% to 12% in the manufacturing industry’s contribution to Gross Domestic Product (GDP) over the period, the potential of the Fourth Industrial Revolution (4IR) to revolutionise the output of local manufacturers has never been more significant to the long-term sustainability of this vital engine room of South Africa’s economy. This was the focus of the recent Manufacturing Indaba, attended by Sassda, industry experts, government representatives such as the dti and sector specific organisations like the Manufacturing Circle. The Indaba provided an invaluable platform to engage and discuss the latest global and local manufacturing trends. It also outlined the efficiencies that can be grown out from South Africa’s largely Industry 3.0 levels, for it to access new markets already resulting from the advances of 4IR tech developments. Commenting on the key insights from the three-day event, Tarboton said; “South Africa is no longer a cheap labour destination. We need to fully embrace the changes that Industry 4.0 brings to manufacturing with a forward-thinking mindset to keep ahead of the curve. Industry 4.0 is already here, and we’ve been warned we can expect to be disrupted. South Africa’s challenges to embracing 4IR include rising costs of production, low productivity within a largely unskilled labour force, electricity price escalations, administered prices, imports of cheap products, political uncertainty and consumer confidence. Speaking at the conference dti Director General Lionel October foresaw the prospect of a global trade war underpinned by US President Donald Trump’s determination to institute protectionist tariffs to boost homeland production within the United States. This continues to create uncertainty but October said that with the launch of Industrial Policy Action Plan Version 10 already under way, the challenge in the next 10 years will be in how to expand the real economy. “Successes to date are seen in the local automotive industry, which constitutes 33% of manufacturing and contributes 6% to GDP, with the production of 600 000 vehicles a year and employment of 113 000 people. There has been R45-billion invested in foreign direct investment (FDI) and its been necessary to create partnerships to achieve this but the new master plan, soon to be completed, hopes to see us move to the production of 1-million cars per year. “In the clothing, textiles and footwear industry, there are 95 000 people employed with modest growth and 22 new leather factories online making this sector 100% designated; this will be followed by Government’s job summit in September and an investment summit in October. However, we need a bold and comprehensive plan to deal with inequality and the historic Apartheid exclusionary policies of 90% of the population. Opportunities have been wasted in the past few years; state owned enterprises (SOEs) were hijacked and did not perform. During his presentation Guy Lundy outlined the fact that artificial intelligence is seeing the replacement of repetitive and unsafe tasks in manufacturing, with people becoming monitors of technology resulting in increases in upskilled people. New generations will need to be trained in skills and big data analysis will play a role in reducing faults and delivering less downtime. Calling on the manufacturing industry to be the ‘backbone’ of the economy Ayanda Mngadi of the Manufacturing Circle felt that the launch of the Map to a Million, together with the launch of the dti’s Intsimbi Future Production Technologies Initiative which boosts training of artisans for Industry 4.0, will greatly assist in reindustrialising South Africa. In order to help build South Africa, Kearny Partner Theo Sibiya said, “We need to ask what can we do? We felt there was a need for new business models, transfer of knowledge and better quality of engineers. The Factory of the Year Award, recognising manufacturing excellence in South Africa, has been launched to benchmark excellence by world-class standards and point to an applicants’ strengths and where improvements can be made.” At the same time, the SAIMC is engaging with ECSA to introduce a tenth engineering degree in automation engineering. The 4th Industrial Revolution is Looming…does SA have the skill set?